This is the third screen of the Netscape Account Wizard. POP should be selected by default, so you will not have to change that. Enter your incoming mail server. This server will be the same as your domain with "mail." added to the front. 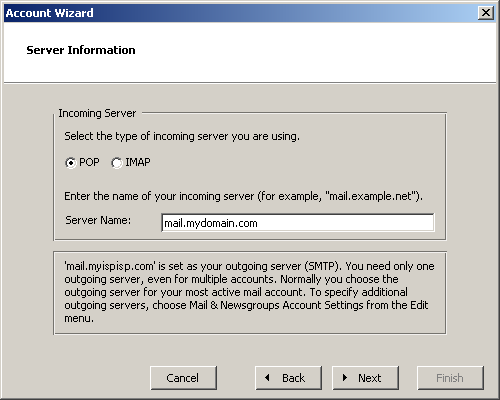 Thus, if I owned mydomain.com and purchased email for it, my incoming mail server would be mail.mydomain.com. After entering the mail server click the "Next" button. To continue this tutorial click "Next" in the screenshot below.